What a first half it was for the San Diego Padres. This team, that nobody expected anything from, is 2 games ahead of the Rockies and Dodgers for first place. In this post, I am going to show you some key players that have helped the Friars to first place after the first half of the 2010 regular season. Mat has been a star so far this season. 10-4, ERA of 2.45, WHIP of 0.97, and a opponents batting average of .193. You can’t do much better than that in the first half of the season. It’s been reported that the Padres are gonna rest this young stud for a few starts after the break, which is fine with me. You don’t want to overuse and risk injury in a young starting pitcher, especially with the stuff he has. All of this said, he has been a key factor in the 51-37 Padres. The Padres bullpen is by far the best in the league. I’m not bragging, they have all the stats to prove it. A 2.91 ERA, 296 K’s, and holding teams to a combined .217 average all point to the Padres bullpen. They also have fantastic 7-8-9 inning guys, with Gregorson, Adams, and Bell respectively. They are known now, to Padres nation, as GAB. Also, Ryan Webb and Tim Stauffer, who just recovered from appendix removal have stepped in when members of the GAB need a break. Lefty Joe Thatcher has retired some good left handed batters with a nice curveball and a sneaky fastball. Not only has Yorvit Torreabla and Nick Hundley done an awesome job with the pitching staff, they also have made a big difference with the bats as well. Nick Hundley is more of the power guy, while Yorvit Torreabla will hit singles and doubles. It is a great combination to have, and you know, whether it’s Yorvit or Nick, that you’ll have a good man behind the plate and a good hitter up there when it’s time to swing the lumber. What else can be said about this guy? He is a beast. 18 homers, 56 RBI’s, a .301 batting average, a gold glove at first base, he can do it all. Absolutely incredible. David Eckstein is, as me and Padres announcer Mark Grant like to call him, our “Little Mascot”. He always does the little things (and the big things) right. Runner on second and nobody out? No problem, he can go opposite field and move the runner over to 3rd base. Need a walk off homer? No problem. He proved he can do that in April vs. the Giants. Hyun Young of Perpetual Padres Saga made a sign that said “Fear the Scrappy.” Fear him indeed. He is an awesome member of the Padres, a great leader who always does the little things correctly. The San Diego Padres also have a few players that I didn’t mention that make a big impact on this team. Chase Headley had a solid first half, batting .270. Aaron Cunningham has come up from the minors and made a huge impact. Clayton Richard, Jon Garland, Wade LeBlanc, and Kevin Correia have all been solid in the rotation. I am really, really excited to watch this team in the second half of the 2010 campaign. I think we can keep proving doubters wrong and keep winning. It will be an exciting second half of the season, there is no doubt about that. The Home run derby is today, who do you guys think will win it? I think that Hanley Ramirez will take home the HR derby title. I think he’ll win it because more of his home runs are line drive home runs, not fly ball homers. That’ll benefit him in the derby. We can only wait and see who comes out with the 2010 home run derby. My laziness, (sigh) I’m so sorry for not blogging for a really long time. It is awful, but I totally will start blogging more, I PROMISE. It’s just been hard, I went to Wisconsin for two weeks this month, got home, but i know that’s not an excuse. Anyway, it’s time to start blogging more. starting….. NOW! The Padres currently lead the NL West by 3 1/2 games over the Dodgers. They are 16 games over .500 with a record of 49-33. They are an example of why, still, even in the days of 9-8 games, tape measure home runs, pitching and defense still wins championships. Incredible. Some facts: They are hitting .245 as a team, ranked 14th in the NL. They have hit 58 home runs, also ranked 14th in the NL. on base percentage is .317, and their slugging percentage is .362. Those are all near the bottom of the pack in the NL, yet, they are tied for the best record in the NL, and have the 2nd best record in the NL. Now, the pitching stats. They have a 3.05 ERA, best in the big leagues. They have 12 shutouts, also the most in the big leagues. They’ve walked 259 batters, second least to the Cardinals. All of this said, if you have the pitching, you don’t need to score 5, 6 runs a game to get wins. Defense stats? Well, they have committed 32 errors, second least to the Reds, who have committed 31. Their fielding percentage is .990, which is tied with the Reds for the best in the NL. This ballclub is absolutely incredible. Sure, they don’t score 7 runs a game and have a batting average of .300, but they play the game the right way, and are fundamentally sound. Also, they never give up. Whether they’re down 12-2 or up 12-2, they never give away an at-bat, no matter what. Now, switching subjects to the all star game, the Padres had a few snubs. Adrian Gonzalez made the All Star team as a reserve, as expected, he deserves it. But the Padres pitching staff leads the league in ERA, as you read earlier, but don’t have one pitcher in the all star game. Mat Latos is 9-4 with a 2.62 ERA, and has held hitters to a .192 average, and is very deserving of a all star appearance. Heath Bell has an ERA under 2, leads the league with 23 saves, and didn’t make it. He is on the final vote ballot though, so I hope he makes it on that. There are a couple positives to no Padres being selected, though. They get some much needed rest, which is big. Also, it will keep them motivated to keep playing at a high level, and who can’t use a little motivation? I’m so excited to watch this ballclub right now. Every game, they give it their all, no matter what. They get barely any national recognition, but they don’t care. They just go to every game with the same thought process: get timely hitting, field the ball, and pitch. What a ballclub. The Padres have an off day today, as they head to Washington to play a 3 game series vs. the Nationals starting on Tuesday. First of all, I’m sorry for not blogging for about a month. School’s been busy, I finished it last week, though. I will start blogging more, I promise. This Padres ballclub is very interesting. They play more old-style baseball than the modern game. Their pitching is fantastic, and if they can get one more bat, one more power hitter, for example a Corey Hart, this team will be good. The reason they are winning right now is they are pitching well. If you are an ordinary fan, nothing strikes you or gets you worried about the Padres. So why are they a NL best 32-22? Timely hitting, good pitching, and good defense. The Padres have a new hero every single night. It’s not just one man getting it done, it’s the entire group. Take this for example: Wednesday, against the Mets, the Padres were held scoreless through the first 8 innings. Tony Gwynn led off the 9th with a single, and then proceeded to steal 2nd base. Matt Stairs and Jerry Hairston then K’d, bringing up David Eckstein. He singled up the middle, driving in Tony to tie the game at 1 apiece. The Padres then won it in the 11th on an Adrian Gonzalez walk off grand slam. It’s really awesome, because you know that even if some hitters in your lineup are slumping, other guys can come through. Now to the pitching side of things: The Padres have 5 quality starters. Sure, they don’t have a #1 elite pitcher, but they have 5 guys that could be a #2. Wade LeBlanc, Jon Garland, Mat Latos, Kevin Correia, and Clayton Richard could all be #2’s on a lot of teams. 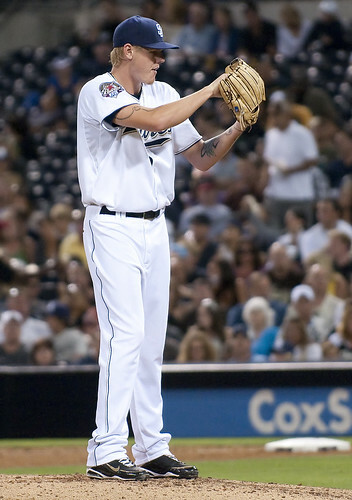 Mat Latos, though, is going to be a #1 starter for the Padres for a long time. He has the stuff, and is growing a lot this season as a starting pitcher. Wade LeBlanc is coming into his own as well. He was dominant in his first couple starts of the season, then struggled in 2 straight starts. He rebounded and did not have a bad outing last time out against the Mets, throwing 5.1 innings of 2 run ball. Jon Garland is pitching very well, along with Clayton Richard. Kevin Correia had a tough 2 outings after the death of his brother, but then won his next start, although he didn’t pitch well, giving up 6 runs. All of this said, one big bat could make a big difference for the Padres. I prefer they go after Corey Hart of the Milwaukee Brewers, who is a right handed slugger that would be great in a lefty-filled lineup. The Brewers want pitching, and the Padres have an abundance of pitching, more than enough, so I think the Padres and Brewers could make a deal there. The Padres lost game 1 to the Phillies yesterday, but today they’re back at it again. Jon Garland, who’s been stellar for the Padres this season, goes up against lefty Jamie Moyer. Should be a great game, first pitch is at 4:05 PM PT. I hope everyone has a great and safe day today, God bless! Hey everyone, thank you so much for checking out my blog!!! I really appreciate everyone checking out my blog! I was recently 39th on the MLBlogs leaders list, and I am very happy. To all my readers, thank you very much!!!! These guys are all slumping. I know its not time to push the panic button, its really early in the season, but I am still concerned. Hopefully they can break out of their slumps very soon, we need their bats in the lineup. There is one man who has been swinging the bat well. That is Yorvit Torreabla. The dude can flat out hit. He has been the best bargain in free agency. The Padres look to end their 3 game skid versus the Giants tonight at 7:05 PM PT. 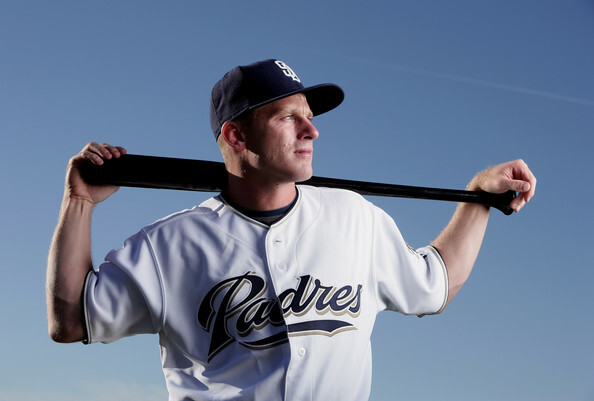 I can’t wait, Clayton Richard goes for the Padres versus Matt Cain of the Giants. Have a good afternoon and night everyone, and God bless! First of all, I apologize for not blogging for about 2 weeks. I will try to blog much more often. They are 21-12, and have the best record in the major leagues. Now, say you were told before the season that the Padres would have a 21-12 record, with Adrian in a slump for the Padres’ last 11-12 games. You wouldn’t have believed that, would you? This team is not all about 1 player, it’s about a team. I believe in them. I think they believe in themselves. And boy, is it showing on the ballfield. The Padres are leading the league with 44 stolen bases. It is some kinda nice. This changes ballgames. Take this as an example: Earlier this year, the Padres faced Jonathan Sanchez, who was on his game. The only hit he and the Giants allowed that day was a leadoff single in the 4th by Chase Headley. After the single, Headley stole second, advanced to 3rd on a popout, and scored on a sac fly. The Padres won that game 1-0 with only one hit for them. No one is talking about the Padres. Not ESPN, not CBS, not FOX, it’s funny, it really is. They have the best record in the NL, and they are still talking about other teams. No credit is given. But the good thing is, these Padres don’t care one bit. They don’t care one single bit. They’re just going out and getting wins. Sure, some wins aren’t pretty. like when they left 16 runners on base when they beat the Giants 3-2 on Tuesday. But so what? That 17-2 win earlier in the year shows up the same as the 3-2 win on the W/L column. Finally, pitching has been the key to the Padres so far this year. The bullpen is fantastic, and the starters are pitching well. You get to the 7th inning as a starter with the lead? Easy. Gregorson, Adams, and Bell finish the ballgame up with a W more times than not. Need a stopper? We got Jon Garland, a vet, ready to take the mound. There was some sad news on Sunday, when Padres fans heard that Kevin Correia’s brother fell off a cliff while hiking with his friends, and died. The funeral is today at 10:30 AM at Saint Agnus Catholic Church. Please, say a quick prayer for the Correia’s as they go through the rough time. I am praying for them. God bless the Correia’s and R.I.P. Kevin Correia’s brother. Today, at 12:45 PM PT, the Padres go for a 3 game sweep over the Giants. Mat Latos, following up his best outing last time up, goes against Jonathan Sanchez, who has only allowed 5 hits in his last 2 starts. Should be a great game. Have a great day you guys, stay safe, and God bless!!! These Padres are rolling. 4 wins in a row, great pitching, defense, everything. Plus a little drama. It all started on Friday versus the Diamondbacks. He deposited a 3 run walk off dinger into the stands in right, a BOMB. I was going nuts. Final score, 6-3 Pads. I went to game 2 at PETCO on Saturday. It was great. Before the game, Adrian Gonzalez received his Gold Glove for the 2009 season. It was great. The Padres scored in the 1st on a double play groundout to make it 1-0. In the 4th inning, Nick Hundley sent a liner over the wall in left for his first big fly of the season. There was no more scoring until the 7th, when Scott Hairston walked with the bases loaded to make it 3-0. Nick Hundley was up next, and hit a little ducksnort single, scoring 2. The Padres then shut out the D-Backs over the next 2 innings, and the Padres took game 2, 5-0. Game 3 was much like game 1, in a way. The D-Backs took a quick 2-0 lead, and held it until the bottom of the 7th. Leading off the bottom of the 7th was Scott Hairston and he hit a homer just over the left field wall, making it 2-1. The D-Backs then proceeded to get the next two outs. Everth Cabrera then singled, stole second, and Jerry Hairston then hit a run scoring double. Of course, they walked Adrian again. Chase Headley got another chance to make the D-Backs pay for walking A-Gon, and boy, did he cash in. He hit a 2 run double. Then the cutoff man botched the throw home, and Chase ran all the way around to score. It was awesome!!!!! Mike Adams then did a great job, as he retired the D-Backs 1-2-3. Heath Bell came in to shut the door. Although he gave up a run scoring double to Stephen Drew, he still earned the save, and the Padres swept the D-Backs, final score was 5-3. The Padres began a 3 game series at home versus the Giants last night. Clayton Richard was pitching for the Padres versus Matt Cain of the Giants. The Padres got a quick run in the first inning on a Adrian Gonzalez sac fly. The Giants got that run back in the 4th, though. Pablo Sandoval hit a run scoring single, making the score 1-1. In the 6th, Kyle Blanks led off with a triple. 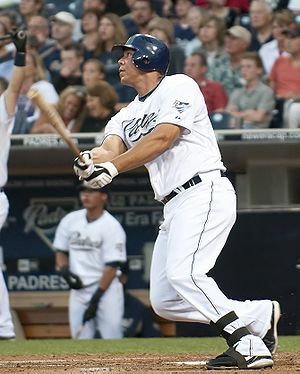 Will Venable then hit a sac fly, and the Padres took the lead. There was no more scoring until the top of the 9th, when Heath Bell came in to try and shut the door. But Juan Uribe hit a solo homer, tying the score. It was still 2-2 going into the bottom of the 10th, when David Eckstein led off the inning with a drive to deep left field, going, going, GONE!!! PADRES WIN!!! Eck hit a walk off homer, and the Padres won 3-2!!! And things are coming together. Hopefully the Padres can keep this win streak alive. Mat Latos goes for the Padres tonight versus Jonathan Sanchez of the Giants. The Thunder also play tonight in game 2 versus the Lakers. The Thunder had a tough game on Sunday, losing 87-79. Hopefully they can take game 2. Have a good rest of afternoon and night everybody!! Stay safe, and God bless. First of all, I want to thank everyone for visiting my blog. In the latest MLBlogs leaderboards, i placed 47th, it’s my first time in the top 50! So thank you everyone, I really appreciate it :). Secondly, it’s been an up and down road for the Padres in these first 8 games of the season. They are 3-5. By far the best win they’ve had was the 17-2 win over the Braves, that was sweet. But the 6-1 loss last night just proves that in baseball, even when you think you have it figured out, you can still go out there and lose against a pretty good pitcher. They fan into an ace last night, or at least he pitched like one. His name was Tommy Hanson. This man has some nasty stuff. He has an upper 90’s heater, a 12-6 curve, a sweeping slider, man. He just was too much for the Pads to handle. The man pitching today for the Padres, though, has stuff similar to Hanson. His name is Mat Latos. I love this great game of baseball. Part of the reason is, unlike football, you can redeem yourself quicker. In football, if you lost, you have to wait a week to try to redeem yourself. But in baseball, you can redeem yourself the next day. I sure hope the Padres can redeem themselves and win the rubber game of this 3 game series versus the Braves!!! This has nothing to do with baseball, but the Thunder wrapped up their 2009-2010 regular season yesterday. Kevin Durant won the scoring crown over LeBron James, and the Thunder play the Lakers in round 1 of the playoffs. First game is at 12 noon on Sunday on ABC. GO THUNDER!!!!!!!! Have a good day everyone, stay safe, and God bless!! !